Hi everybody, this is my firts topic here in baby pips, i would like to share with all of you my way to see the markets,after making a lot of backtesting and reading TONS of books, i have finally found something that works for me and fits my personality, hope i can get some feedback from you guys, these are some of the trades i took this week, im looking foward to post weekly the results im having and share some valuable content with all of you. In EU the price was in a clear uptrend so after the previous imoulsive leg i pulled out the fibonacci retracement tool, i was expecting the price to come to the 61.% Fibonacci retracement level wich is in a very good confluence zone but after that hammer candle at 50% i decided to take the trade and ride it to the -27% extention level, but after all that positive news for USD and the divergence i closed at the weekly S/R zone securing my pips. 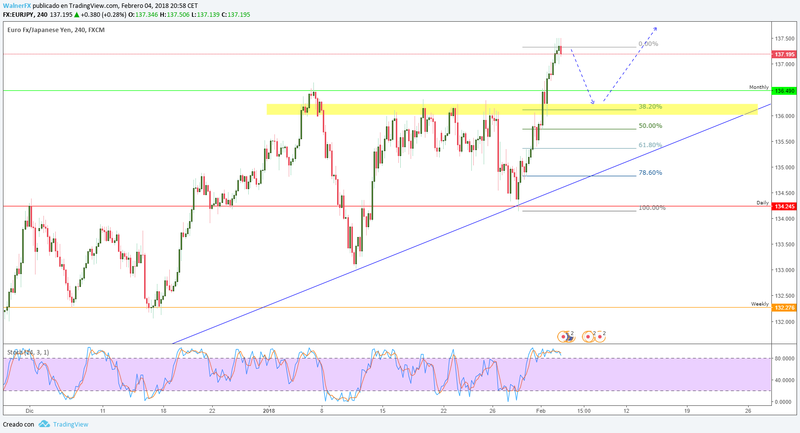 This one was easy, JPY was the weakest currency at the moment and CHF was strong against the others, we have a clear breakout + price breaking structure and making HH and a confluence of 50% Fibonacci retracement level + broken TL + past resistance new support, my firts tp was the daily S/R zone and the second -62% fib extention level wich makes a confluence with the Weekly S/R zone. 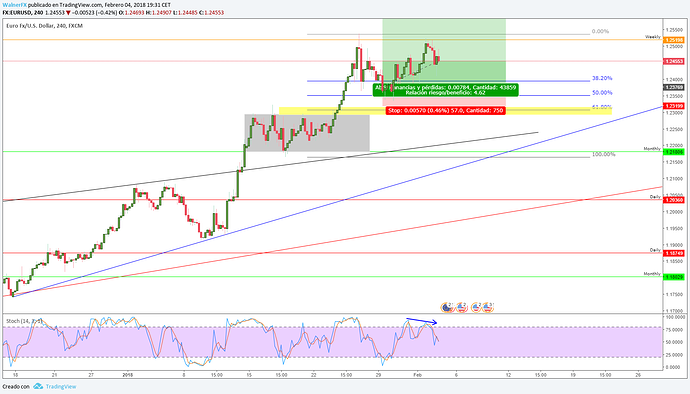 I left GBP/CHF, AUD/CAD and EUR/NZD opened trought the weekend using the same principles, just riding the trend after a pullback, again hope i can get some feedback and advice from you guys. I like EUR/USD too walner, I’m already long this pair. EUR is strong, I also am long EUR/JPY, looking to place a buy order tonight for EUR/NZD and I’d like some other EUR longs in the next week if I can get in at reasonable prices, EUR/AUD and EUR/CAD look OK but not enough reasons for me to buy just yet. I’d be interested in CHF/JPY if it pulls back deeply. My charts looks a bit messy but they will get better with time. Hey Walner…Not at all…you can see your strategy at a glance… they look clean and concise. What time frames are you working with, the correlations on those pairs must be horrendous are you running the risk of doubling down on the same bet. I only trade off daily charts but I look at the weeklies to confirm trend consistency. I’m aware of the risks but when EUR pairs are all bullish I’m happy to be long all EUR pairs. The risk reduces as they start to make profit equal to initial risk and I can start to pyramid. Cool, if the pyramid works for you then great. I would say diversify into less correlated pairs. The Swap is against you on pretty all those pairs if you are trading the D1. I guess you have priced that into your trades. The theory of is on your side - taking multiple trades with highly correlated pairs is high risk. However, in practice the benefits out-weigh the risks and in this sense by “risk” I mean only risk of loss of account capital. I am careful to limit this using stop-losses at a low % account capital risk level and by cutting losers by 80% when they get half-way to my stops. Pyramiding all winners also helps maintain an asymmetrical winnings/losses ratio. However, by not using profit targets and by pyramiding on a grid basis, I accept very high losses out of unrealised gains. These would rattle most traders and are again contrary to trading theory. But the best theory in the world won’t pay the bills. Sounds interesting. Did you shoot a video about your strategy? Do you have statistics? Sounds great. If you get in on a trade and double down at time t + 1 when the trade is winning, how can you be sure that that market will continue to move in your favour. You may end up whipping out the gains you achieved on the trades that you got right, whilst the trades hat appear to be loosing now, end up swinging in your favour. Cheers. No, I don’t do videos or statistics. I’ve published the strategy on several threads, its all simple stuff but with aggressive details at key points - decide IN ADVANCE what criteria would make a trend attractive, get into EVERY trend that fits, pyramid EVERY winner that gains profit equal to initial risk, NEVER set TP’s, ignore resistance in uptrends and support in downtrends. I re-capitalised the account in the beginning of November to 5 figures and since then its up about 110%. Thanks for the quick response. I’ll keep your info on mind. Yes, that’s true. The difference is I don’t care about losing unrealised gains. I don’t get it then, how does the system hedge your risk. plus your winners and losers are not going do the same in sync unless they are well correlated and you re playing off that; say u were trading EURUSD and USDCHF. and even in that case you are basically betting that the market will surge in one direction or the other, any retracements of reversals would mess up what you’re trying to achieve. Not sure what the objective is in what you;re suggesting. However, for if EUR/USD and the majority of other EUR-based pairs are bullish, I want to be long this pair. 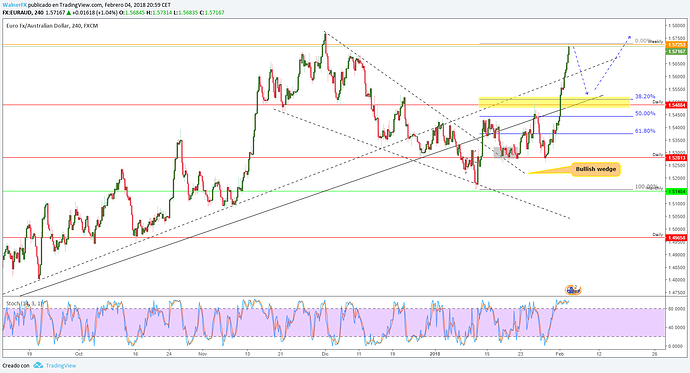 If USD/CHF and the majority of USD-based pairs are bearish, I want to be short this pair. Yes, that means I’ll have a double short position on USD. Actually, I’d be happiest if I had trades on 1 market only, but pyramided 20 times using the grid. Yes that would be a massive position to one single theory, but at no capital risk (barring black swans, as ever). Say we have an uptrend, and my buy order is triggered at 5000. The TA shows me a stop-loss level about a hundred pts lower, a swing low or something like that: for ease of the example let’s say its exactly 100pts lower (I don’t advocate using a fixed stop distance, only TA-based stops). Let’s say the position size is £1/pt. Initial capital risk = -£100. The initial trade, Trade 1, is open at 5000 with a SL at 4900, position size is £1/pt. I also enter a new buy at £1/pt at 5100, with SL 5000. If Trade 1 goes straight to SL, I close 80% of it at -50 and the rest at -100. Net loss = -£60. 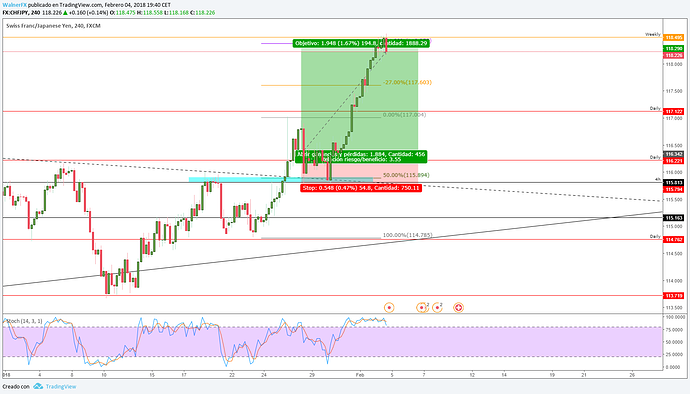 If Trade 1 goes to 5100, Trade 2 is opened. I move the SL on Trade 1 to entry, 5000. Capital risk = -£100. I set a new £1/pt buy, Trade 3, at 5200, with SL at 5100. If Trade 3 is triggered at 5200, I move the SL on Trade 1 to 5100, move the SL on Trade 2 to entry, 5100. From this point onwards, capital risk is £0. I set a new buy order, Trade 4 at 5300, SL at 5200. And so on and so on. While price is increasing from 5000 to 5199, my capital risk is £100. But as soon as Trade 3 is triggered at 5200, capital risk cannot be greater than zero, whereas I will now benefit from price rises at £3/pt. This causes unrealised gain to rise parabolically as additional trades are added. R:r can quickly get into double figures for no additional risk. The downsides are firstly that you carry the -£100 capital risk for twice as long as if you just ran a single trade with a 100pt trailing stop. Secondly, if you use the 100pt grid as your SL definition, it means that all trades will close simultaneously when the latest SL is hit, with a 100pt loss per trade. Traders would be able to decide personally if its worth them taking profits at what looks like a high, or holding on and swallowing the considerable loss of unrealised gains in order to maximise return. There’s no right answer here I believe. As a practical example, last month I was able to push a GBP/USD long to 7 overlaid positions. R:r on 7 overlaid identical sized positions using the grid SL is 1:14. But in reality its better than that as risk after Trade 3 is zero. Interesting. You forgo the gains you have already made in search of more with a a larger position size. In the end ultimate success depends on the market moving steadily in one direction or the other, otherwise your layered trades will all close out. So the bet really is that the movement will be steady in one direction, any other case and you lose, or break even. Yes, that sums it up. Basis is that the most common next action by a trending price is to continue the trend. And if that happens the r:r becomes increasingly asymmetrical (towards reward) so there is an increasing “risk” of increasingly big wins, while there is a limited risk of limited losses. The most annoying thing is not ever knowing when a trend will break, as all positions close when the highest SL is hit, I don’t use TP’s. But then again, nobody else has a way to predict the future either. Cool, how do you find your entry for the upward or downward quasi spiking market; that could be useful.